Uploadcare is a complete platform helping you build file handling on the web. Save resources spent building the file infrastructure, optimize your content, conversions, load times, traffic, and UX. The four major components of Uploadcare are the upload interface, storage, media processing, and CDN. 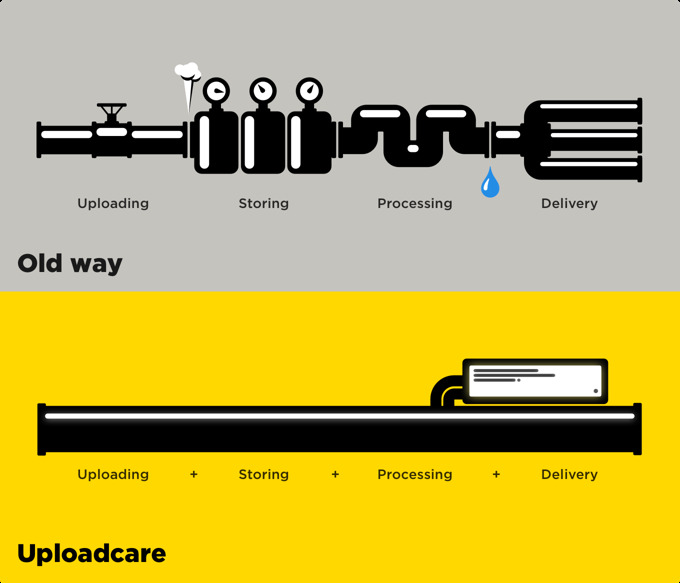 When integrating Uploadcare, you get all of these components seamlessly working together. You don’t even have to sign up to check out how uploads work. There are things like Quick Start and playing with our demo account keys. Each time a file gets uploaded, your app receives a CDN link with its unique file identifier, UUID. UUIDs are then used by our APIs to handle files: copy, store, and request detailed info, all that kind of stuff. Uploadcare allows you to process media files by using our DSL. This implies the processing operations are applied by including their respective URL directives. You can use those to process images, GIFs, videos, and detect objects. Where ucarecdn.com identifies that you are addressing our CDN, :UUID points at a specific file, :operations tell us what to do with it, and :filename can be set to any RFC3986 compliant string. The last two are optional: your file might be better off with its original filename and no manipulations. To practice, you might want first to sign up. After the signup, you’ll start with our Free plan. It’s there forever and is packed with oodles of features ready to play with. For example, say you want to try our Quick Start and interactive widget configurator to grasp how the Uploadcare workflow feels like. If you want to use Uploadcare with a specific language or platform, check out the libraries and integrations. We’re striving to make Uploadcare as useful and simple as possible. Make sure not to miss other links in our sidebar. There’s so much more in there. We’re always happy to hear from our users and other super cool folks. Check out our community area or hit us up at hello@uploadcare.com.